TORONTO – On a hot, sunny weekday morning, hundreds of people take the ferry to the Toronto Islands, filling beaches, paths and picnic areas that just a year ago were flooded by record-high lake levels. At Hanlan’s Point, the quiet westernmost wing of the islands, visitors walk and bike past giant sandbags still lining the shore. Most are heading to the clothing optional beach. But those who stay on the path a little longer will come across a vital piece of Toronto history, practically cut off from the rest of the city. 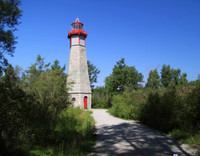 The Gibraltar Point Lighthouse guided ships into Toronto’s harbor when the port was the city’s most thriving commercial asset. Built in 1808, when Toronto was still called York, the lighthouse is the oldest structure of its kind still standing on the Great Lakes and the second-oldest in Canada according to Heritage Toronto. “It really doesn’t function as a lighthouse anymore, now they use electronic beacons to keep ships off,” said Warren Hoselton, the City of Toronto’s Parks Supervisor for the islands. It was decommissioned in the late 1950s and handed over to the City of Toronto. The shores of Lake Ontario have receded over the years, leaving the lighthouse a little more than a hundred yards short of the water. Its cool stone walls, dappled by chipped white paint, are mostly hidden by dense greenery from the well-used path around Hanlan’s Point. Just steps from the old lighthouse clearing is a lush wetland, populated by ducks, gulls and herons. In one version, Radelmüller sold the soldiers a batch of liquor diluted with water. When the alcohol froze during a long winter march, the men realized they had been cheated and returned to the lighthouse for revenge. In another version, the keeper was serving soldiers at his home and made the mistake of trying to close up shop early, which resulted in a deadly fight. It is said that after killing Radelmüller, the irate soldiers hacked his corpse into pieces and this is the reason he cannot rest in peace. Radelmüller, age 52, indeed suffered a violent death on January 2, 1815. According to Eamonn O’Keeffe, two Irish soldiers, John Henry and John Blueman of the Glengarry light Infantry, were charged with the murder, but acquitted at trial. And contrary to claims the keeper was hacked to pieces, his remains were found and buried near the lighthouse. But if the legends are true, many old lighthouse keepers remain on the job after death and who’s to say Radelmüller isn’t among them? Sources: Peter Goffin, The Times Colonist, July 27, 2018, and Eamonn O'Keefe, "New Light on Toronto's Oldest Cold Case: The 1815 Murder of John Paul Radelmüller," University of Oxford, December 2015. That lighthouse looks familiar. I think that it may have been a Mystery Location in one of our old groups. I seem to remember it, too. But if it's the one I'm thinking of, the photo was taken during the fall when the trees were turning. I think that it was posted around Halloween.